A little DisplayPort for HDMI adapter that allows you to connect with large screen and other laptop. This Mac and Apple product compatible port can be connected to any two systems. Quite compatible with most of the PC laptops, monitors, TV / HDTVs, projectors etc. While using it make sure video port on Apple computer is a Thunderbolt port. You can use it with the following connections. 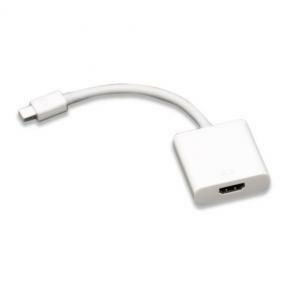 Specifications Connectors: Mini DisplayPort (Thunderbolt Port Compatible, male); HDMI (female); Compliance: Mini DisplayPort v1.1a compliant; Resolutions: 1920 x 1200, 1080p, 1080i, 720p, 576p, 576i, 480p, 480i.